The Gepco® Brand miniature coax series features exceptionally low attenuation for its type while maintaining a reduced size and weight. All utilize a pure-copper center conductor, low-loss foam dielectric and broadband foil and braid shielding. 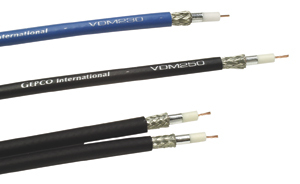 VDM230 features the same gasinjected dielectric found in the HD coax series making it ideal for standard-definition digital video, AES3id digital audio or highdefinition digital video interconnect within mobile production trucks. VDM250 and VDM250D are recommended for short distance, low bit-rate digital, analog video, or SVHS applications. The VDM230TS is recommended for plenum installation.